THE STORYS HIT THE ROAD following stand-out live performances at legendary venues King Tuts, 100 Club and, not forgetting, an impromptu gig at the Glasgow Odeon screening of new British blockbuster The Bank Job, a film in which they feature. The Swansea six-piece comprise of no less than four singer/ song-writers, adding much versatility to their melodic brand of Americana and drawing comparisons to The Eagles, The Byrds and The Burrito Brothers. 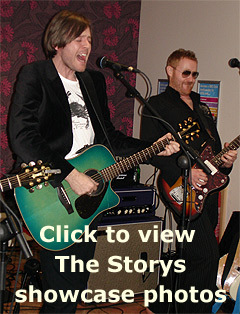 Check out thestorys.co.uk and myspace.com/thestorys. HAVING ALREADY REVIEWED TOWN BEYOND THE TREES, an exceptional album with the title track of particular merit, we knew what to expect. They're great musicians and singers and sound fantastic on the album tracks. But live performances can be, if you'll forgive the pun, a different story. A band performing live is opened up. They are exposed as individuals; not just performers. The Storys proved to have terrific personalities and they shine at their live performances. They interact visibly with each other and with their audience; they are professional, very natural and really do look as if they are enjoying themselves. They are as good to watch as they are to listen to and the rapport between the six musicians who make up The Storys is remarkable. Lead vocalist Steve Balsamo, told MotorBar: "What you see is what you get. We go back a long way and we get on well. We couldn't work together as closely as we do  on stage and writing songs  if we didn't have that bond." There is an element of the Seventies about The Storys so it wasn't surprising that when a band from that era was needed for the film The Bank Job  the current Number One box office smash starring Jason Statham  The Storys were invited to take part. By sheer chance, while in Glasgow for a gig at the legendary King Tuts and staying at the Paisley Road Travel Lodge, The Storys' bassist Andy Collins slipped out for a drink and noticed that the Odeon on Springfield Quay was showing The Bank Job. Steve explains: "Andy popped in and got chatting with the manager. The conversation turned to the film and the fact that the band were in it  and as a result we set up in the foyer between shows and played six or seven acoustic numbers, with just a vocal PA. We played to one audience coming out and another coming in, so we ended up with quite a crowd. They were lovely people and really enjoyed it. Some of them came to the gig the next day too." The set included tracks from the film, including I Believe In Love as well as tracks from the band's new album Town Beyond The Trees, which is released on 31 March (2008). at Swansea Liberty Stadium on 29 June (2008). A big band with melodies and vocal harmonies to match, The Storys are: Steve Balsamo (vocals/guitar); Andy Collins (vocals/bass); Dai Smith (vocals/guitar); Rob Thompson (vocals/guitar); Brian Thomas (drums/percussion) and Alan Thomas (keys/mandolin/banjo). Great guys! Great songs! The fantastic new album Town Beyond The Trees and the superb single Long Hard Road are both released on 31 March (2008). 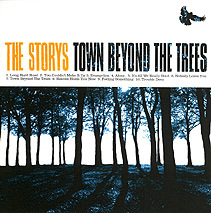 BEAUTIFUL SOUNDS AND MUSIC HARMONIES fill the air as South Wales band The Storys entertain with Town Beyond The Trees  their much-anticipated second album to be released on 31 March (2008) on Hall Recordings. Song after song is worth listening to, with the gentle vocals especially good on the opening track Long Hard Road  reminding you of gentle coastal breezes, convertible pink Cadillacs and impromptu beach parties. The song that gives the album its name  Town Beyond The Trees  is heart-melting and poignantly poetic with an established sound. Following on from the acclaimed 2006 eponymous debut and some high-profile live performances  including with Elton John and Katie Melua  Town Beyond The Trees has a catchy title and a catchy rhythm throughout. Love it! The Storys mix the country rock harmonies of The Eagles and Crosby Stills Nash & Young with the acoustic side of Led Zeppelin and the West Coast pop of The Byrds and The Burrito Brothers. It is a sound that has already won many fans, and there are more waiting in the wings. 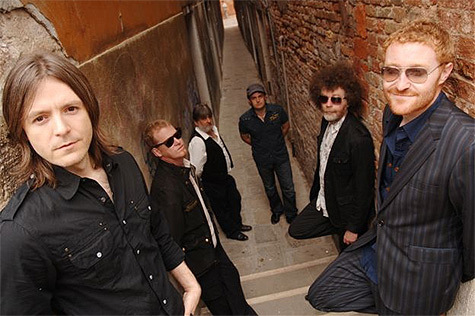 The Storys  Steve Balsamo (vocals/guitar); Andy Collins (vocal/ bass); Dai Smith (vocals/guitar); Rob Thompson (vocals/guitar); Brian Thomas (drums/percussion) and Alan Thomas (keys/mandolin/banjo)  are a big band with melodies and vocal harmonies to match. The mandolin and banjo explain the easy country feel that pervades the album, delivered with an almost casual classic style. Having four singers who are also songwriters gives the band versatility. But there is certainly no conflict  if anything, the band have progressed as a unit in the song writing. As Dai says: "If one or two bring a song idea in, we all work on it and it becomes a six-way cooperative. This second album is more of a group experience." The album Town Beyond The Trees is issued on the band's own Hall label, named after the converted cinema where their self-produced debut was recorded. This new album was recorded at Peter Gabriel's Real World studio complex earlier in 2007, with renowned producer Jon Kelly. Kelly's impressive CV includes Kate Bush, The Beautiful South, Paul McCartney, Chris Rea and The Damned. The collapse of the record label Korova/Warners (who picked up that debut) turned out to be a blessing, with the band able to retain control of the recording and producer Jon Kelly agreeing to stay on and finish the album. It was then that the strings were added, giving the album its final polish. The band have come a long way in a short time, both finding a co-hesion in the studio and having to pull together when playing stadiums with Elton John. Dai remarks: "The album only took five weeks to record, and it sounds fresher for it." on 31 March is the album's lead single, Long Hard Road. Long Hard Road  A song about reassurance; what doesn't kill you will make you stronger. Many of the Storys songs are based on grains of personal truth. This is about reaching out to someone in their hour of need. You Couldn't Make It Up  A grown up pop song, its about a family unit breaking down; going through a trial separation and coming home one day to find someone else has moved in. An example of an uplifting melody, with a dark soul-searching lyric. Feeling Something  When the first stages of love hit and someone becomes a part of you, you ask the question: are they feeling the same way? As you fall deeper it is important to know, as you commit your life to them. It is a simple song about falling in love. Evangelina  Is a girl who's trying to be righteous and true, but who has not been so in the past. Someone comes into her life and turns her whole world around in seven days. Supposedly the world was created in seven days  but hers was destroyed. It's All We Really Need  About someone leaving home with a dream of making something of themselves in the world, but quickly finding that they've not even come close. Sometimes it's easier not to return home at all than to come back and admit defeat. Nobody Loves You  This is about an affair. It can be read as both romantic and sinister, with the line 'nobody loves you… like me…' having obsessive overtones. Much in the same way as Every Breath You Take on the surface is a love song, but it hides a darker subtext. Town Beyond The Trees  This was actually written before the first album. It's a live favourite, more sprawling, very organic and based on a true story about a guy on death row writing a letter to his unborn son. It's a very affecting story as some of the band have recently had children and there's no rule book when you become a father. Trouble Deep  Is about somebody who is in a cycle of making the same mistakes over and over again but is always running away from them rather than facing them. Rosalie Deighton sings the harmony vocal. She toured with us last year, and we fell in love with her voice. Steve did the harmony originally but as soon as Rosalie put her voice down, the hairs collectively stood up at the back of our necks. She adds something very special to the song… almost ghost-like and ethereal. Heaven Holds You Now  Sometimes we let people down, but this song is about hope and holding onto our dreams and realising we are all in the same boat. It also talks of the loss of someone close and dealing with it. Alone  This is about the search for true love and finding that special person who makes you realise it's a lonely life without love.